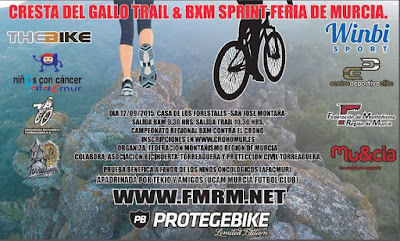 DESDE LA CASA DE LOS FORESTALES -SAN JOSE MONTAÑA- SE CELEBRA ESTA NOVEDOSA PRUEBA A CARGO DE LA FEDERACION DE MONTAÑA Y LA ASOCIACION BICIHUERTA. LA SALIDA DE BXM SERA A LAS 9.30 HRS.Y LA SALIDA DEL TRAIL A LAS 10.30 HRS. LA PRUEBA SERÁ CAMPEONATO REGIONAL BXM CONTRA EL CRONO. COLABORA. ASOCIACION BICIHUERTA-TORREAGUERA Y PROTECCION CIVIL TORREAGUERA. PRUEBA BENEFICA A FAVOR DE LOS NIÑOS ONCOLOGICOS (AFACMUR).